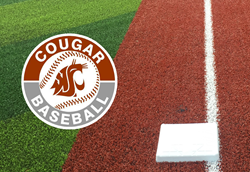 Washington State's Bailey-Brayton Field, home of the Cougar Baseball program, will receive AstroTurf's state-of-the-art Diamond Series playing surface. Washington State’s Bailey-Brayton Field, home of the Cougar Baseball program, will have a new playing surface for the 2018 season, WSU Director of Athletics Bill Moos announced Friday. Bailey-Brayton Field will receive AstroTurf’s state-of-the-art Diamond Series playing surface, replacing the FieldTurf that was installed in 2004. The infield FieldTurf was replaced in 2013. Installation is underway and is scheduled to be completed later this month. For this synthetic turf system, the infield “grass” portion of the field is comprised of a combination of advanced fibers that mimic the look, feel, and playability of natural grass. Base paths, warning tracks, and batter’s box all feature a proprietary fiber blend of shorter pile height that accurately emulates clay. All of the elements of the playing surface have been engineered for optimal ball bounce, ball roll, underfoot feel, and durability for the specific part of the baseball diamond in which they are installed. A special feature called the RootZone acts like a net to encapsulate the sand and rubber and to reduce its splash for more natural hops. This AstroTurf is used at approximately 80 percent of all Division I synthetic baseball fields including The Ohio State, Vanderbilt, Michigan and Oklahoma.